(Nanowerk News) With the promise of sunlight into fuel, strontium titanate (SrTiO3) is widely studied. The problem is the optical band gap or the energy needed to get electrons to do work after being hit with light. At 3.2 electron-volts, the gap requires ultraviolet light. Scientists at Pacific Northwest National Laboratory shortened the gap to 2.3 eV, putting it in the visible light regime ("Band-Gap Reduction and Dopant Interaction in Epitaxial La,Cr Co-doped SrTiO3 Thin Films"). The shorter gap is thanks to a new technique that fabricates epitaxial strontium titanate films with equal concentrations of lanthanum and chromium additives, or dopants. An expitaxial film is created by putting a crystalline layer on a crystalline surface one atom at a time to make an ideal material. The added elements reduce the gap without creating any undesirable defects. Model of the growth process showing one lanthanum and one chromium ion on the film surface during growth and an image showing the color changes of the films with doping concentration. Strontium titanate and other titanium oxides are excellent candidates for solar hydrolysis-splitting water into hydrogen and oxygen molecules using visible light. The materials are exciting because of the electron conduction bands, or energy-level jumps electrons make to be available to work, align with the reaction energy needed to split water. However, the optical band gaps mean that visible light, where the solar spectrum is most abundant, is not enough. This work shows that strontium titantate can be made to absorb visible light, creating new opportunities to use this material for solar hydrolysis. Further, this research enables possibilities to create oxide-based solar cells. Led by Dr. Ryan Comes, a Linus Pauling Post-doctoral Fellow, and Dr. Scott Chambers, a Laboratory Fellow, researchers at Pacific Northwest National Laboratory and Argonne National Laboratory, have developed a new technique to fabricate epitaxial strontium titanate thin films. Epitaxial doped Sr1-xLaxTi1-xCrxO3 films were deposited using oxygen-assisted molecular beam epitaxy on strontium titanate substrates. Chromium dopants in strontium titanate interact strongly with light and are known to enhance the extent to which strontium titanate can channel the energy in sunlight into the splitting of water to make hydrogen. However, without the lanthanum dopants, oxygen vacancies form and these trap electrons and reduce performance. By matching the concentrations of the two dopant atoms, the group was able to make pristine materials without vacancy defects. The films were characterized using a variety of techniques including in situ X-ray photoelectron spectroscopy, scanning transmission electron microscopy, electron energy loss spectroscopy, atomic force microscopy, and optical absorption at Pacific Northwest National Laboratory. Through collaboration with Dr. Steve Heald at the Advanced Photon Source at Argonne National Laboratory, the team also probed the oxidation state and structural environment of the chromium dopants using X-ray absorption fine structure measurements. 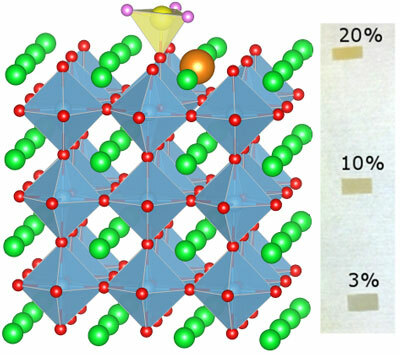 These measurements confirmed that the co-doping technique produces the ideal Cr3+ oxidation state expected and provided the somewhat surprising result that the lanthanum co-dopants occupy lattice sites directly adjacent to the chromium ions. By performing density functional theory calculations to model the film growth process, lead theorist Dr. Peter Sushko showed that the lanthanum and chromium ions tended to diffuse across the film surface during growth until they bind to each other on the surface. The ions were then incorporated into the lattice as neighbors, matching the observed experimental results. Interestingly, this phenomenon would not be expected in a bulk material, as it is unique to the atomic layer-by-layer growth that occurs during epitaxial growth. The team is moving forward with the work, exploring uses for the co-doping technique in thin films for solar hydrolysis and ferroelectric photovoltaics. They are also eager to explore other dopant combinations that may have useful optical properties. These materials may include doping two lanthanum ions for every one iron or nickel ion to stabilize the ions in the lattice, which could reduce the band gap even further. By developing a library of these co-doped materials with different optical band gaps, it may be possible to engineer a multi-junction solar cell with excellent efficiency absorbing visible light. These materials could offer alternatives to expensive and hazardous materials commonly used in solar cells today.